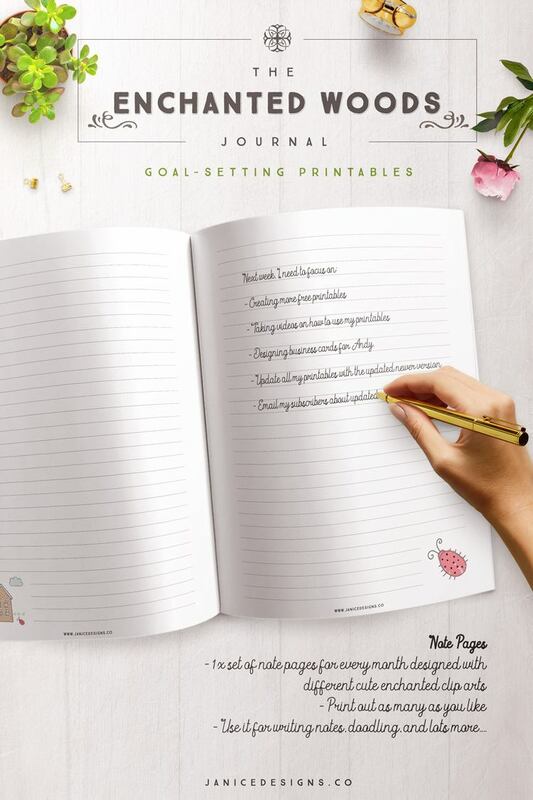 Are you tired of drawing lines and tables on your bullet journal over and over again? If you have a bullet journal, you would probably know what I’m talking about. Realizing that the hours you’ve just wasted could’ve been well-spent planning and decorating your planner rather than spending on those mindless, repetitive and unfruitful tasks for your journal. Not to mention, the number of rules you need to follow to create your bullet journal. Now it sounds like I am against bullet journaling. None at all. As a busy mom of four, I often do not have the luxury to sit down and draw lines and tables for my journal. I just want to get on with it and start planning. Every minute is precious to me. This is my humble and honest opinion. Have you ever experience writer’s block? You know when you stare at your note book or bullet journal and you do not know what the heck to write or where to start. Seeing a blank or lined notebook makes you this way sometimes. But fret not, because what if I told you, you won’t be stuck or bored ever again? 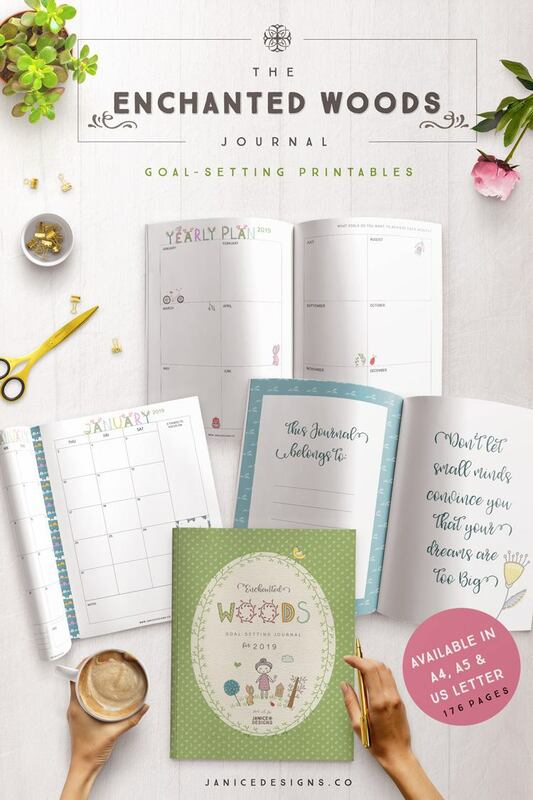 If you’re ready for a change, you will love The Enchanted Woods Journal Printable Collection. So basically, for every month, you will get a set of Monthly Planner, Weekly Planner and Note Pages (which you can print as many as you like) for those days where you feel like writing your heart out. These pages are color/pattern co-ordinated for the respective month. So you will have 12 different patterns for each month. The monthly planners are dated for 2019. Where as the weekly planner is un-dated – in case if you miss a week or two, then you won’t need to skip pages. There are lots of room for you to write, doodle or paste your washi tapes or stickers to further personalize your journal. 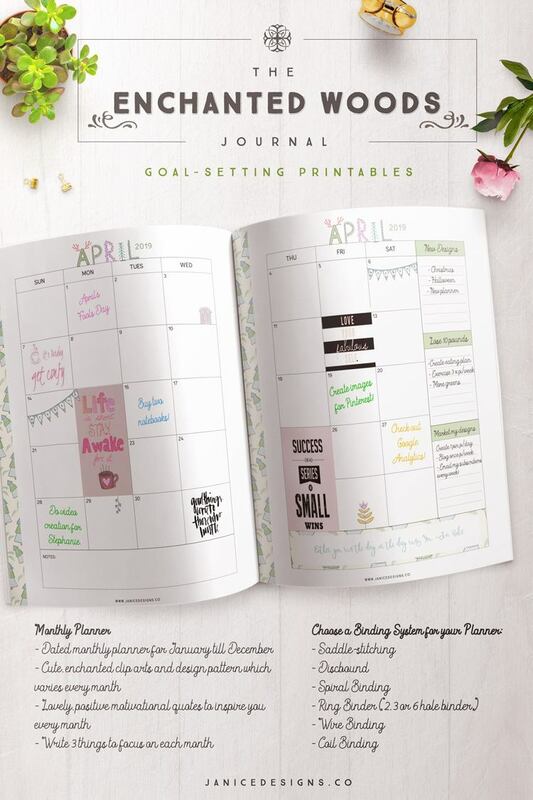 Here’s a sneak peek of what the monthly planner pages will look like in this printable journal. And the image next to it is a close up of the monthly planner. 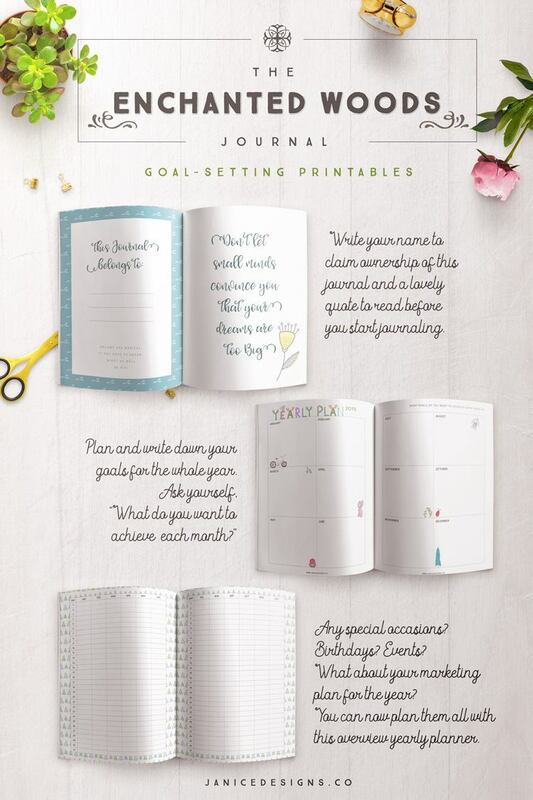 It also shows you an example on how to use this planner. Use stickers, printable quotes or whatever you like to decorate your planner. Number 3: You feel clueless because you do not know where to start or what to write when you are staring at your blank lined note book or the typical diary you would normally find in your stationery shop. And I would like to add another one.. Number 4: You may feel unmotivated, un-inspired, lack of confidence and direction in your life. Or feeling just plain lazy because you need some push and guidance to help you get started with goal-planning. 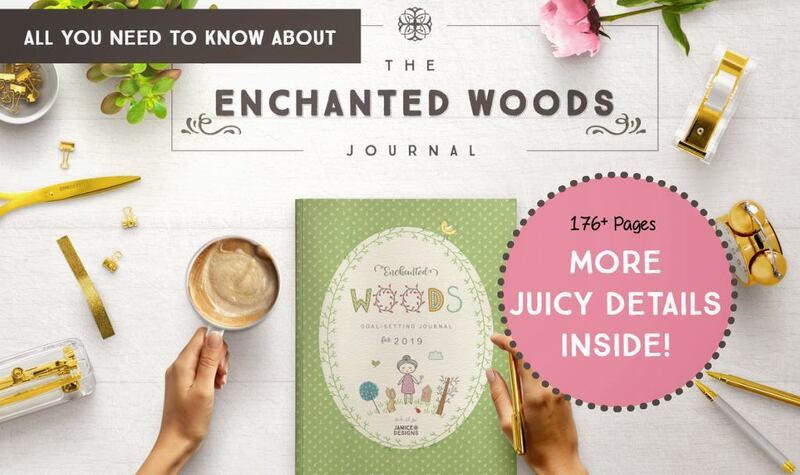 Then I am confident that you will love the Enchanted Woods Journal Printable Collection. 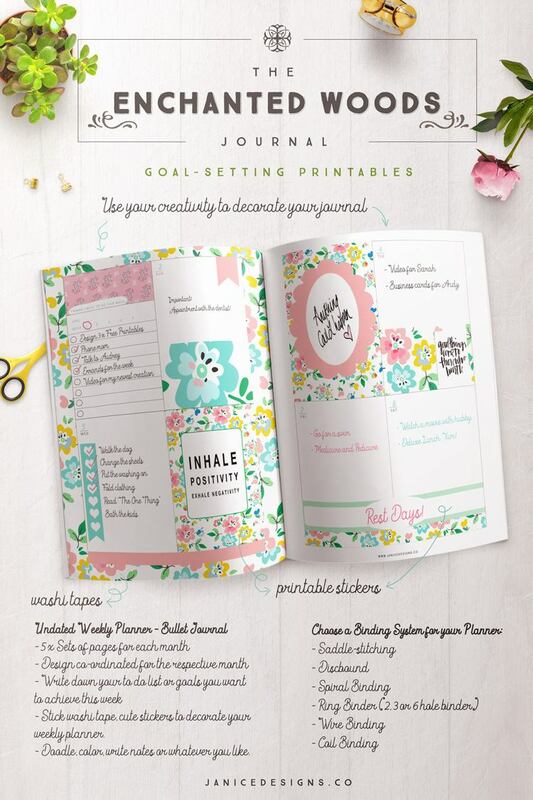 As mentioned previously, it’s a cross between bullet journaling and goal-setting printables. I took the best of both of these ideas and created something special with this magical theme. Below is what the Weekly Planner pages will look like. As previously mentioned, these pages are un-dated, so you can add them yourselves as you plan. So if you do miss a couple of weeks, you don’t need to skip pages – saving you ink and paper. 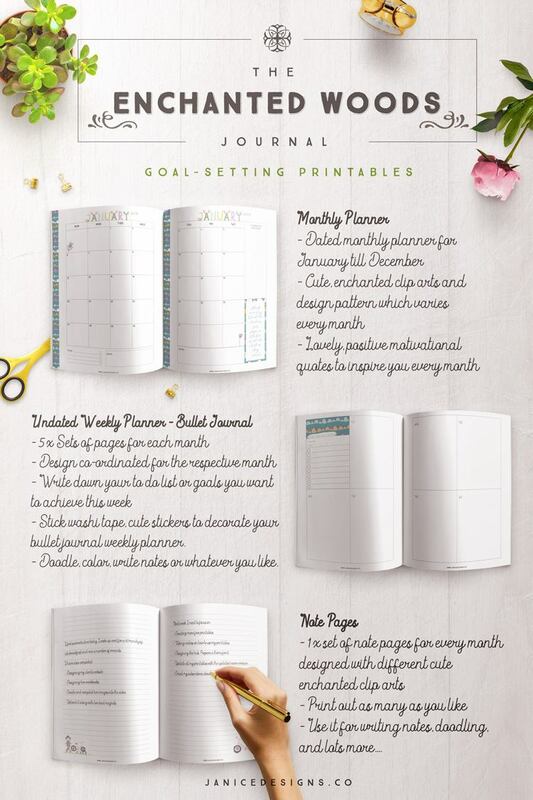 The image on the right is a close up page of how you can use and decorate your Weekly Planner pages using various sorts of mediums such as colored pens, markers, highlighters, washi taps, printable stickers, quotes and much more. Below is a sneak preview of what the Note Pages will look like inside this journal. Write notes or journal your thoughts away with this very cute note pages. And the image on the right is a close up page of your Note Pages. So that’s everything inside this journal. I’ve kept it relatively simple so you can take over and go crazy with it. Put in your own twist, your style and personalize it to make it your own. And if you like what you see so far… I would really appreciate it if you would SHARE this blogpost (click the floating social icons on your left on desktop and bottom if you are using a mobile) to those who would benefit from this journal. So we’ve gone through the problems you may be facing right now and the solution to have an organized and fantastic 2019. And I believe this sweet collection will help you get there. And now, we’ll quickly go over the different binder systems you can choose before printing your journal. We won’t go into much detail today, but I promise that I will write in more detail in another blog post on all the different types of binder systems out there and what they are. But if you’re really curious to know what they are now.. you can always Google to find out more. Some of these options above especially the spiral, wire or coil binding can be done by your local printer. All you need is to print at home, arrange it to your liking and take it to your printer to bind them for you. Or better still, send the file over and get your printer to do it all for you. There may be a small fortune to get them done for you, but you save precious time in the process. Remember though, you need to plan first and inform your printer in detail on how you want the pages to be arranged so they can do it for you. They can’t read minds. Nothing beats a personalized planner that you have put much thought and care into. The paper and print quality will also be better and your journal will look professional. And you only need to do it once. And once its printed, it’s done and all ready to be used for the year. 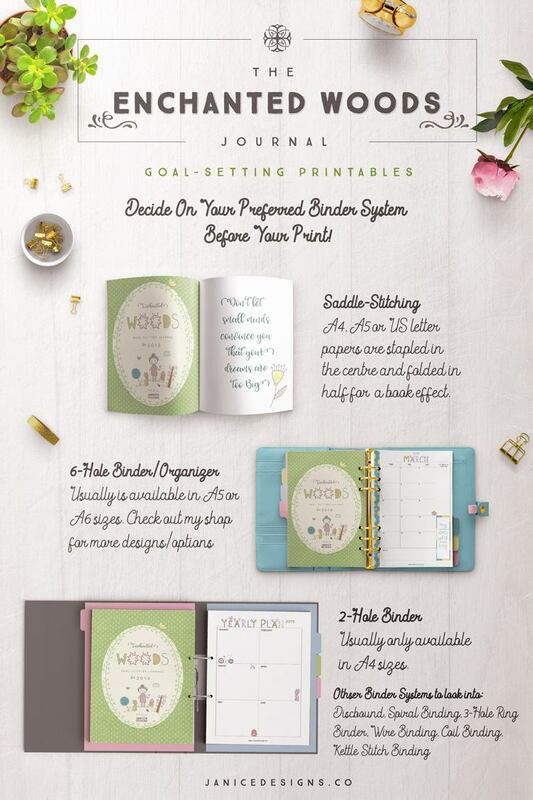 I personally like the 6-hole binder/organizer (see image above) as I am already using it myself because I like to move pages around and having the option to do so is perfect for me. If you are looking to get the 6-hole ring binder yourself, check out my shop for more design options. I am currently using the A5 size binder. And for those who do not know what A5 is, it is half of an A4 size. Although it isn’t as big as A4 (see tall picture above as reference), I can still comfortable write on it and it is small enough to be portable if you’re contantly traveling. 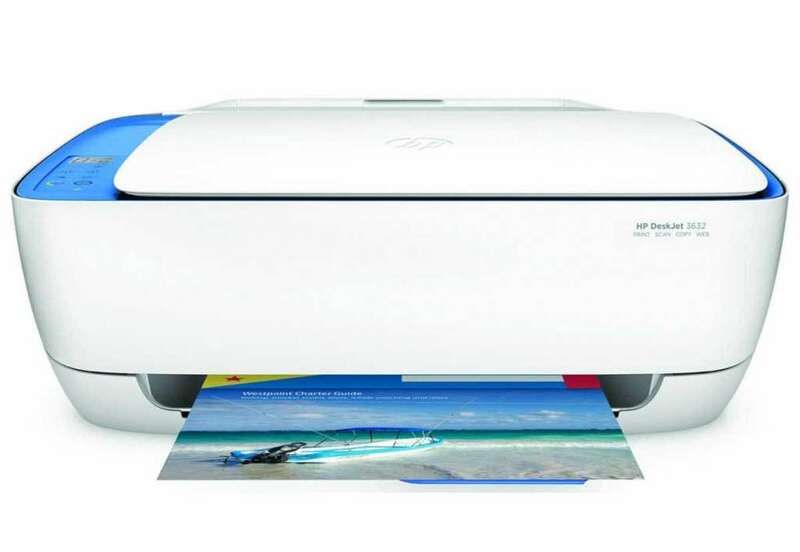 I have a basic HP printer – HP DeskJet 3630 and yes, it is an inkjet printer. I know there are used or conterfeit HP ink cartridges out there that is cheaper but the print quality may be questionable. I like my prints to look great (crisp and clear texts) hence I always opt for the genuine cartridge. The quality of the print also sometimes depends on the printer settings that you use. For everyday print, I opt for the ‘Normal’setting under print quality. But if I’m printing photographs to be framed, I use the ‘Best’ settings. There’s another way you can save on ink and that is buying better quality paper for your inkjet printer and if you buy in bulk, you may be paying a little more upfront but you save heaps down the line and you could use it for years to come. When you opt for a better quality and a heavier paper weight for your printable planners, I only set my print quality to ‘Normal’ and I get really nice clean, crisp, bright print and you’ll be very pleased with it, I promise. Earlier we talk about getting your printer to print it for you.. but if you’re on a budget and printing it at home like myself, I recommend using the 100-120gsm for paper weight. It’s a slightly thicker paper weight than your regular paper at home. The regular ones here in NZ are 80 gsm. I am currently using the Navigator brand. I opt for the Presentation paper 100gsm, the one in maroon (the ticked options in RED below are my recommendations). Again, I save on ink because I set the print quality to “Normal”. And it prints great! The dark navy on the far right one (160gsm) is a way thicker paper and is probably suitable for your cover page. I choose the Presentation paper because the print quality is better, paper is much whiter and brighter than regular paper and as a result, your print will stand out too. I will have to try the Orange one(above) – Color Documents 120gsm paper in the future and will let you know how that prints. And because it is also a heavier paper weight (100 gsm and above please), your pages will not tear easily especially when you turn the pages over in your ring binder. The ink will also not leak at the back of the paper. This will let you print back and front so you could save on paper too. I’ve done this personally and I’ve loved the results. 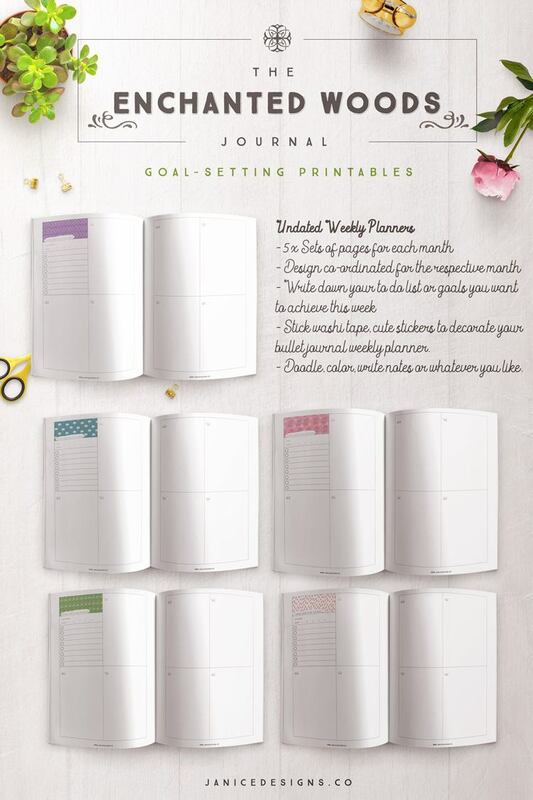 Again, I will be making another blog post on how I put my printable planner together. I will let you know when the post is ready. I will also need to do some research on what you guys are using in the US so I can recommend some brands to you. Choose your preferred binder system – Saddle-stitching, 2,3 or 6 hole ring binders or other binder systems mentioned above. Get your local printer to print and bind the journal for you if you have lacked of time. Go on a budget by printing it yourself. Choose the right paper weight for better print quality and save on ink. Alway choose a genuine ink cartridge or toner for your inkjet or laser printers for better quality print. 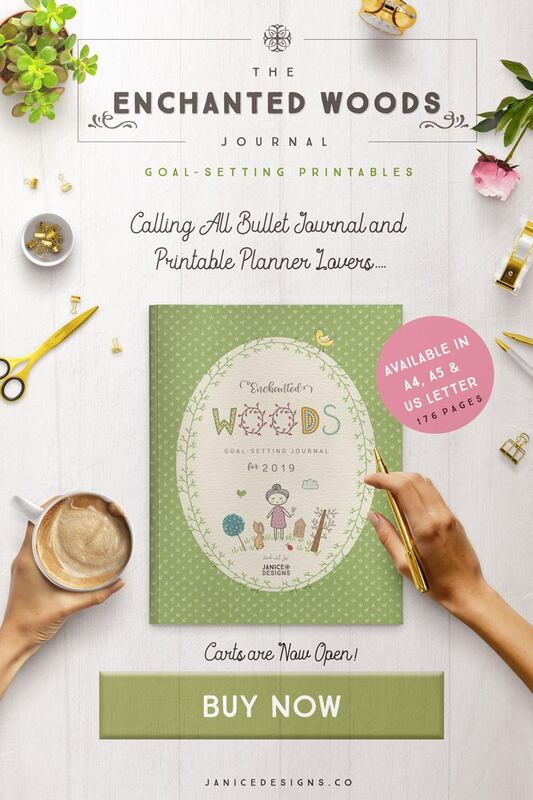 I hope this post has been educational and helpful so you can get started on your first personalized journal or planner if you haven’t already. And if you found this post helpful please help share it and comment below what are your thoughts are on this new printable collection. 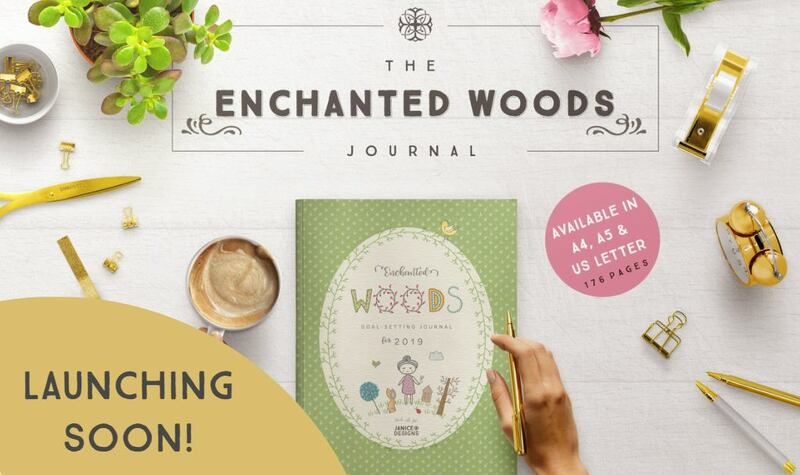 The Enchanted Woods Journal Printable Collection is NOW LAUNCHED. Click the image below to purchase your copy NOW! I’m very excited to launch my newest creation which is coming VERY SOON to you.. The launch date is set to this Sunday, 11th November. Jot it down, put a reminder and remember it, my friend. My newest product is a journal printable collection and this is specially made for the bullet journal and printable planner lovers in mind.. If you like doodling, writing notes, scrap booking, using washi tapes and cute stickers on your journals.. this is for YOU. I wanted to create a product for people to express themselves using their creativity and I have noticed that these group of people who enjoys journaling, enjoys decorating and personalizing their journals. 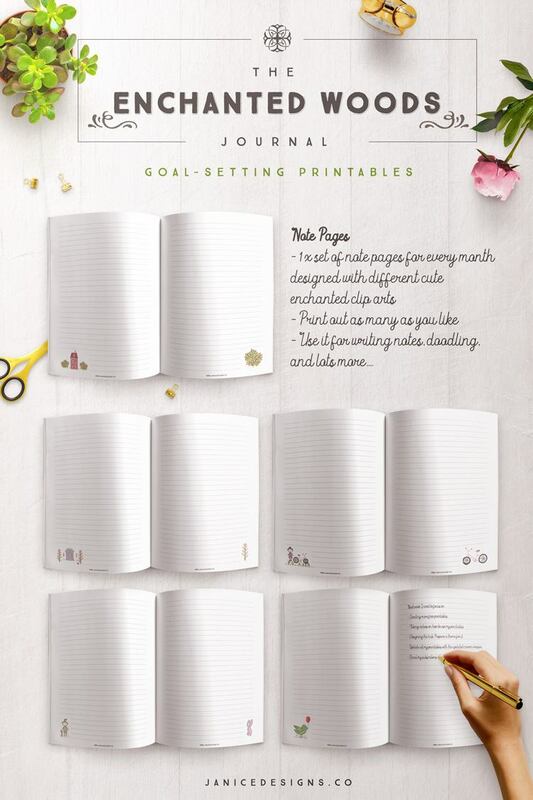 And although this is not your typical bullet journals you see out there in the market place, I have designed it to simplify the lives of bullet journal fans; keeping in mind for those who enjoy goal-setting printables as well. I also love this theme I’ve chosen very much. I have always loved to express the childlike-ness in myself through my products or projects over the years. And in addition to my love of fairy tales, magical forest and beings, I wanted to create a product with this theme in mind. It is a simple, cute but a functional journal. I have kept it simple so you can take over and let your imagination run wild while you create the journal that you love and enjoy using. 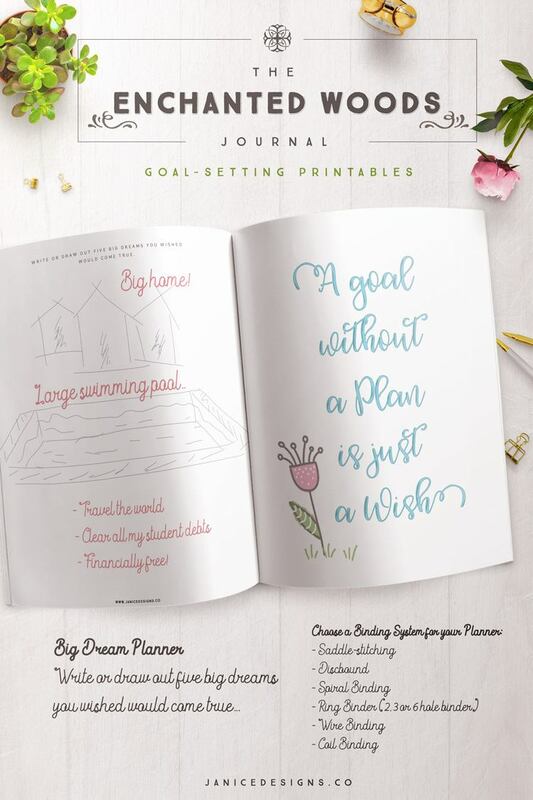 Like and share this blog post if you love what you see and if you know anyone who would love a copy of this sweet printable journal. If you want more printables like this, you can sign up to my newsletter so you will never miss a FREEBIE! 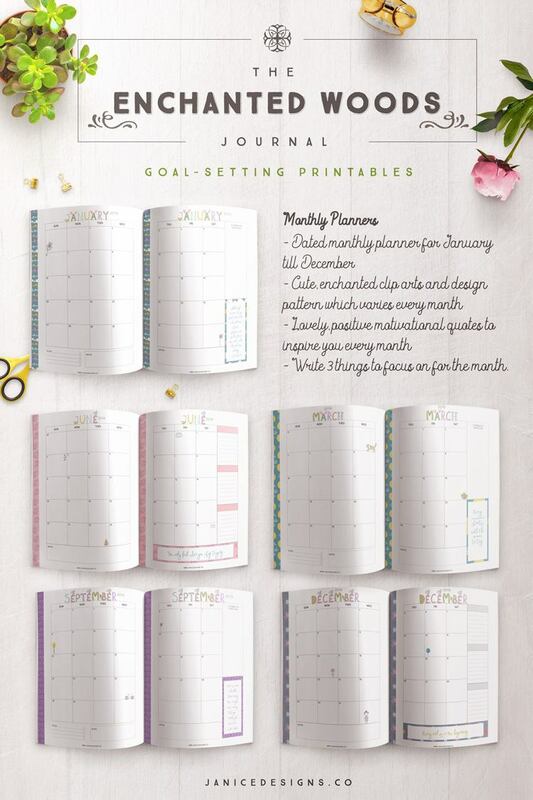 Plus when you sign up now, you will receive TWO very useful printable planners which you can start using straight away + 10% coupon code to use for your first order.